Combine the white dough ingredients and knead until the dough is smooth and elastic. Place in a large, lightly oiled bowl, cover with cling wrap and set aside. In a food processor or blender, combine warm water, olive oil and grated beets. Blend together, then add to remaining ingredients. Knead until the dough is smooth. Place in a large, lightly oiled bowl, cover and set aside. Let doughs rise for an hour; at this point they should be doubled in size. Soak the chopped pistachios in a Tablespoon of warm water (this will prevent them from burning and excessive browning when baked). Divide each dough in half. Starting with the white dough, roll out each portion of dough to a rectangle of 1/8" thickness, keeping the length and width consistent for each piece of dough. 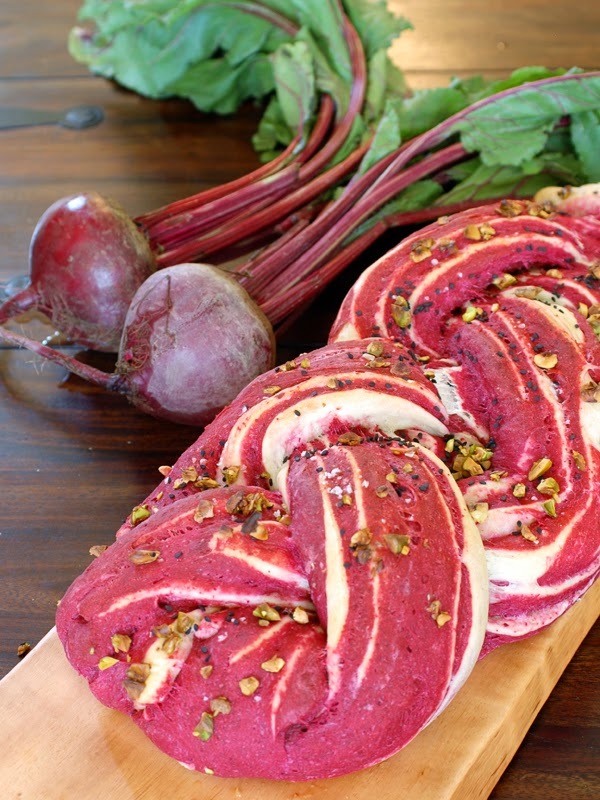 Place a rectangle of beet dough on a rectangle of white dough. Roll up together tightly. Repeat with the remaining dough. Using a sharp knife, divide each roll of dough in half lengthwise. Line up strands on a baking sheet prepared with parchment paper. Drain the pistachios and sprinkle over the braid. Add black sesame seeds and flaked sea salt. Let rise for an hour. Bake for 30 minutes, then remove from oven. Let cool for 10 minutes, then transfer to a wire rack to continue cooling.